Hillsborough County, New Hampshire Christmas Tree Farms: choose-and-cut Christmas trees, Tree lots with pre-cut trees, stands, sleigh rides, hay rides and related winter events and fun! Whether you want to cut your own tree, pick a live tree and have it cut for you, buy a tree already cut or buy a living tree you can plant, this page provides detailed listings of Hillsborough County, New Hampshire's choose-and-cut Christmas tree farms, places to buy pre-cut (also called pre-harvested and fresh-cut) trees, stands, sleigh rides, hay rides and related winter events and fun. Some listings are for tree farms, others are tree lots, and some only offer hay rides, sleigh rides or other winter events. READ EACH LISTING to know what each facility offers. The farms are listed further down this page, so scroll down the page! Since this service is free and open to ALL Christmas tree farms, not just those who belong to an association or pay for an ad, like almost all other websites do, this is the most complete and current listing available! I'm always looking for more to add, and to correct any inaccuracies or errors, so if you encounter any, please email me ! And please tell the farmer you visit in Hillsborough County, New Hampshire that you found their farm here! I need the farmers to realize that you found them here so that they will keep their information up to date! 70 Elmwood Road, Hancock, NH 03449. Phone: (603) 525-3794. Email: info@ourtownlandscaping.com. Open: November to December 24 every day 9 am to 4. Click here for current open hours, days and dates. Directions: Click here for a map and directions. No pesticides are used, Payment: Cash, Check, Visa/MasterCard, Discover, AmEx. U-Choose and Cut varieties: Balsam Fir. 45 Robie Road, Goffstown, NH 03045. Phone: (603-497-2243). Comments from a visitor on December 11, 2011: "I got the number from this web page and called before leaving Satuday Dec 10th, to hear a message with their hours, etc. It was a really pretty drive to find them, but were surprised to see they were closed at 2 pm, when their own sign says open until 3 pm. Undaunted, I decided to try again Sunday Dec 11th. I tried the other number this time, hoping to get a person. (It is no longer in service) SO I called the first number again. It now says they are closed for 2011. We hope to try and get there earlier next year! " Route 3A, Litchfield, NH 03052. Phone: 603-424-9268 Fax: 424-9268. Open: eekends 9 am to 7 pm. BEAUTIFUL fresh cut Christmas trees, wreaths (decorated and undecorated) and kissing balls. Santa visits some weekends - check with them first!. Comments from a visitor on December 11, 2006: "Yes they are precut trees but they make a fresh cut on it and wrap it for you in netting! They have wreaths and swags, Santa this weekend (12/16-17/2006) and goats and ducks to feed! My kids love it!! " 523 Mason Road, Milford, NH 03055. Phone: (603) 673-9077. Email: Click here for their contact form. Open: UPDATE: December 11, 2018: Sold out of trees; They are closed until next season (2019), when their hours should be: Monday through Friday: by appointment; Saturday: 9 am to Dark; Closed Sundays. We still make our pure Maple Syrup the old fashion way on a wood fired evaporator, but we use a new smaller health tap to protect the health of the trees. Complimentary wagon rides, hot cocoa, and hot apple cider at one of our fields each Saturday. A visitor writes on December 02, 2016: "We went on Nov. 26th and they have been adversely affected by the drought. Most of their young trees have been lost. There are very few tree to cut yourself and they are a long walk down a hill so it was a real slog carrying the tree back up. No sleds or assistance provided. They also said on their website that there have been health issues this year so not the best place to go." Comments from a visitor on December 02, 2012: "Absolutely love this place! Friendly, plenty of trees and varieties in all different sizes and shapes - truly something for everyone! Cocoa, hot cider, firepit, saws, friendly dogs are welcome - we have been going here since Zahns closed about 5 years ago. " Comments from a visitor on December 11, 2011: "I called this year and there is only one typ of tree available.."
100 Mountain View Lane, Deering, NH 03244. Phone: 603-464-3252. Email: nazer.farm@gmail.com. Open: Saturday and Sunday from 10 am to 4 pm, on the weekend after Thanksgiving and on the first 2 weekends in December. Directions: Click here for a map and directions. Payment: Cash, only. Click here for our Facebook page. You Choose and We cut varieties: Balsam Fir, Canaan Fir, Fraser Fir. Route 3A, Litchfield, NH. Phone: (603) 759-2264. Email: mrrplemire@msn.com. Open: 10 am to 7 pm daily; Hay Rides every weekend. NEW for 2013 - 2 fire pits, a larger maze for kids, and reindeer!Purchase hot popcorn & marshmallows every weekend to toast on our outdoor fire pits! See Santa every Sunday from 1-3pm and enjoy free hayrides & hot chocolate!Come visit the REINDEER and the rest of the Backwoods Farm! See, pet, and feed the farm animals every weekend (weather permitting). Don't want to cut your own tree? We have pre-cut trees available from 3ft - 20ft tall. Balsam and Frasier Christmas trees. 420 Amherst Street, Nashua, NH 03063. Phone: 603-930-1291. Alternate Phone: 603-494-6322. Fax: 800 240 0623. Email: info@northpolexmastrees.com. Open: Monday to Friday, from 8 am to 9 pm; Saturday and Sunday, from 8 am to 10 pm. Click here for current open hours, days and dates. Directions: Click here for a map and directions. Payment: Cash, Check, Debit cards, Visa/MasterCard, Discover. Click here for our Facebook page. Wholesale, Retail, and Mail Order. All Size Trees from Table Top to 55 Feet. Fire Retardant Available for Public Display. We Ship World Wide. 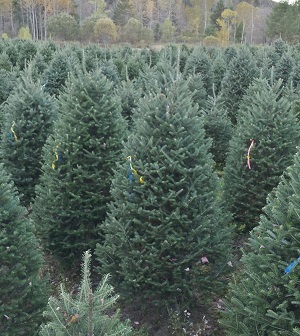 PreCut varieties: Balsam Fir, Blue Spruce, Fraser Fir. Living, rooted tree varieties: Balsam Fir, Black Hills Spruce, Blue Spruce, Canaan Fir, Colorado Blue Spruce, White Fir (Concolor Fir), Douglas Fir, Fraser Fir, Nordmann Fir, Norway Spruce, Ponderosa Pine, Scotch Pine, Virginia Pine, White Pine, White Spruce, and other varieties (call!). North Pole Xmas Trees Location 2 - Precut trees Christmas trees, in all sizes and grades, Premium wreaths & exotic garlands, Supplies like Tree Stands and Mistletoe. The Blushing Rose Flower Shop, 455 Amherst Street, Nashua, NH 03063. Phone: 603-494-6322. Email: info@northpolexmastrees.com. Directions: From Route 3 (Everett Turnpike, take exit 8. Follow exit to Amherst Street (route 101a). Go right. Travel west for 1 mile. Flower Shop on right at lights. is1051 S Willow St, Manchester, NH 03109. Phone: 603-331-2166. Alternate Phone: 603-359-4977. Fax: 603-237-8439. Email: sibgotree@gmail.com. Open: Thanksgiving weekend till sold out; Monday to Saturday, from 8:30 am to 8:30 pm; Sunday, from 8:30 am to 6 pm. Directions: Click here for a map and directions. Payment: Cash, Check, Debit cards, Visa/MasterCard. Click here for our Facebook page. PreCut varieties: Balsam Fir, Fraser Fir, and other varieties (call!). Living, rooted tree varieties: Balsam Fir, Fraser Fir. 274 Poor Farm Road, Weare, NH 03281. Phone: 603-529-2653. Email: doscher@comcast.net. Open: See our website for current hours. Click here for current open hours, days and dates. Updates: Click here for updates. Directions: Click here for a map and directions. We use natural practices, but are not seeking organic certification. Payment: Cash, Check. Other species available include Korean Fir, King Boris Fir, Pacific Silver Fir, Veitch Fir, Blue Alpine Fir (Arizonica), Subalpine Fir. You-Choose and You-Cut varieties: Balsam Fir, Canaan Fir, Douglas Fir, Fraser Fir, Grand Fir, Noble Fir, Nordmann Fir, Turkish Fir, White Fir (Concolor Fir), and other varieties (call! ).